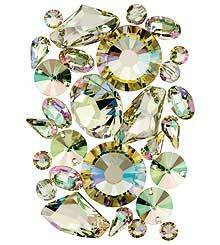 Bi-annually, Swarovski releases their Innovation - Spring/Summer and Autumn/Winter (for the Northern Hemisphere). These are informed predictions of upcoming hottest trends. 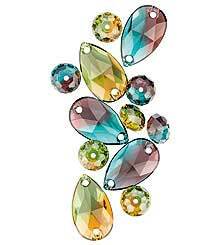 Though not always easily accessible, Swarovski provides a huge amount of information for their authorised customers to be up-to-date and informed of not only the trends, but their newly released products and colors that will complement and enhance that trend. 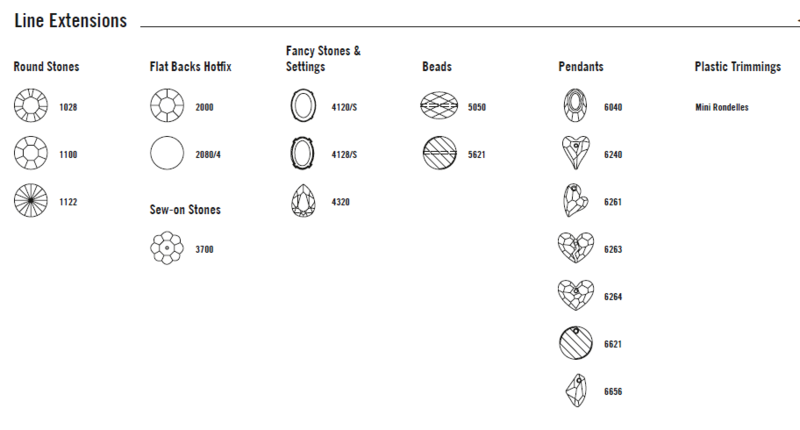 This is a valuable resource for all jewelry-makers and artists. I hope that you will find this information here highly useful in your creativity sphere, as you plan forward to enrapture your fans and clients. 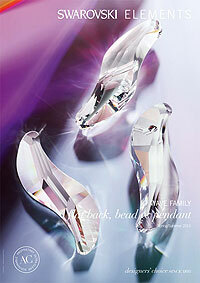 "For SWAROVSKI ELEMENTS, creative innovation in Spring/Summer 2013 is all about authenticity. Challenging times highlight the importance of togetherness, loyalty and traditional values. 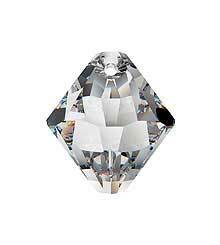 These social qualities are reflected in precision-cut crystals that fuse beauty and technology in sparkling additions of pure simplicity, romantic playfulness and ethnic vibrancy." 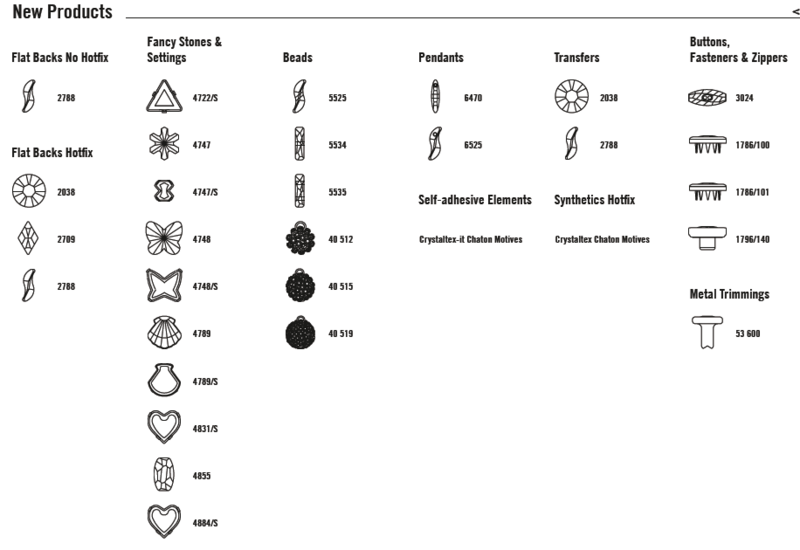 Each Swarovski Innovations announces not only new products, but upgrades to existing articles, and line extensions (either additional colors, sizes) to current catalog. The upgrades normally will replace a pre-existing item. I will not be covering the full gamut of all that is released in this Innovation Spring/Summer 2013 (SS2013). I will cover most of them - especially the new lines/products and important upgrades and extensions. This new effect Crystal Luminous Green is set to be a new classic. It subtly shimmers from green to violet with the play of light. Use it to warm up cold colors, for sci-fi and fantasy tinged creations. Will work equally well for serene and romantic designs. Use this to warm up cold colors. 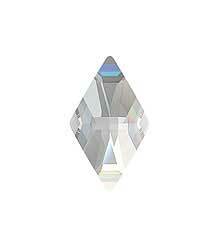 Will work with many skin colors, grays, blacks, pastels, Crystal Peals, and the Crystal Antique Pink. This dual effect will add an extra dimension of vibrancy to your designs. See (in new window): Crystal Luminous Green (001 LUMG) available in. 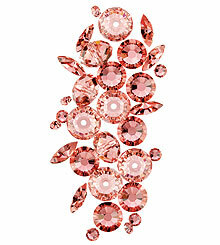 The new Rose Peach colour is romantic, yet bold. Like a combination of cherry blossoms and heady fragrance of roses. Rose Peach is perfect for ethnic jewelry or for a dreamy vintage look. It is touted to be a new design favourite, perfectly expressing the upcoming trend of toned-down luxury. And also because all shades of red are among the best selling colors in the market! Combine Rose Peach with all shades of white, opal, gray, and brown. 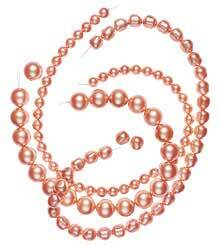 This also softly complement the new pearl color: Rose Peach Pearl. See (in new window): color Rose Peach (262) available in. This new crystal blend: Burgundy-Blue Zircon Blend morphs the two colors of Burgundy with Blue Zircon - a sparkling representation of a late Mediterranean sunset. Use on its own or complement with Sew-on Stones, Beads, and Pendants. A soothing, nature-feel blend evoking a tranquil meditation in the lush, glistening woodland at dusk. Use on its own or complement with Sew-on Stones, Beads, and Pendants. Also combines beautifully with natural materials: straw, wood, leather. See (in new window): Burgundy-Blue Zircon Blend (723) & Fren Green-Topaz (724) available in. This new pearl color/effects is ideal for the coming of spring and summer. Its peach-blushed shade entwines with the late summer's English roses and delicate summer evenings. It will work itself seamlessly into organic, nostalgic, and vintage-kissed trends. This works well with the new crystal color: Rose Peach. See (in new window): Rose Peach Pearl (001 674) available in. Finally! 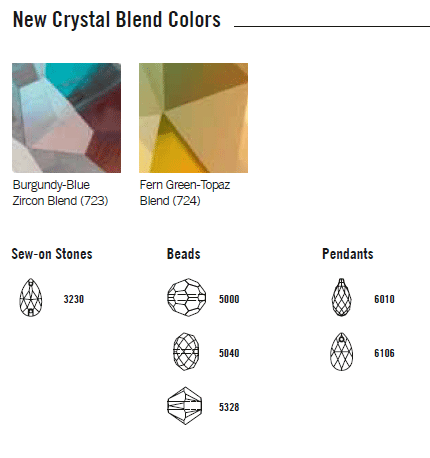 More colors for Swarovski's Crystal Pearls. And this is a great addition and a much needed splash of organically bright colors. 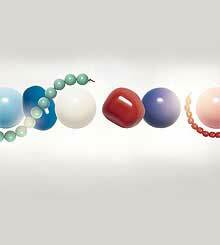 These Crystal Pearls Gemcolors is a flawless, thick, and opaque. It perfectly captures the look of ivory, turquoise, jade, coral, and lapis. This is a fully coordinated seven-color family that lends itself with panache and sophistication to romantic nostalgia, vintage looks, tribal designs, and a dash of vivacity. See (in new window): Pearl Gemcolors available in. As an extra bonus, here are some Swarovski supplied photos showing you some delish combinations of these new Pearl Gemcolors with various coordinated crystals and shapes. You can take ideas and inspiration from these and use them as your springboard to your next creations. This line has extended to offer a new size, with effects & colors. This size extension covers all current assortment using the 1028 XILION Chaton. Additional colors have been added to this article. 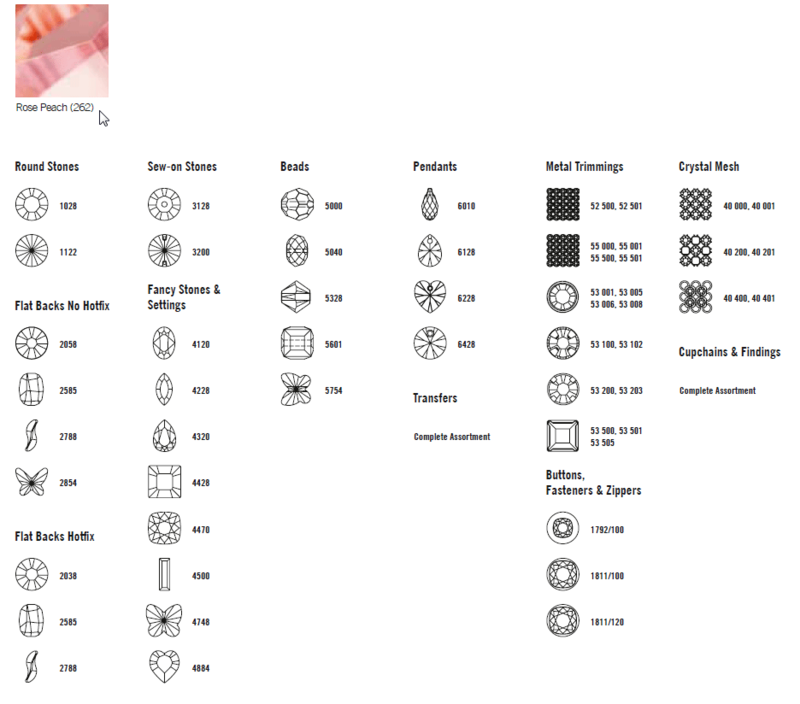 All these are completely new, introduced at Swarovski Innovation Spring-Summer 2013. This innovative shape with the artistic twist comes in a family suite of products including Flat Back (No Hotfix and Hotfix), Bead, Pendant, and as the base articles for Transfers. Echoing the motion of the seas, this new shape lends itself naturally to marine themed designs. At the same time, it space-age twists yields easily to contemporary designs with an edge. They fit just as easily into mosaic arrangements, lacey patterns, or as boldly woven visuals. They can create geometric rows or produce highly complicated designs. The launch of these amazing cuts comes in 12 colors. The matching cuts brings about a highly unified ensemble look but with freedom for the creation of uniquely individual works. 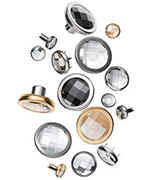 They are available as Jeans Button, Crystal Rivet, Snap Fastener, and Decorative Button. The chessboard cut works well with unisex denim and sports look; classic architectural styling, accessories; textiles. It is glamour with a defined twist. 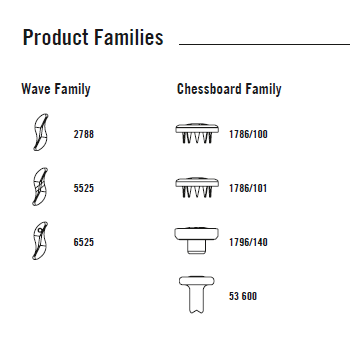 The Wave Flat Back belongs to the Wave Family of new products. Its shape is evocative of the ocean and is a natural for aquatic and maritime look. It will also suit well in romantic, nature-inspired, ethnic, or cool masculine themes. 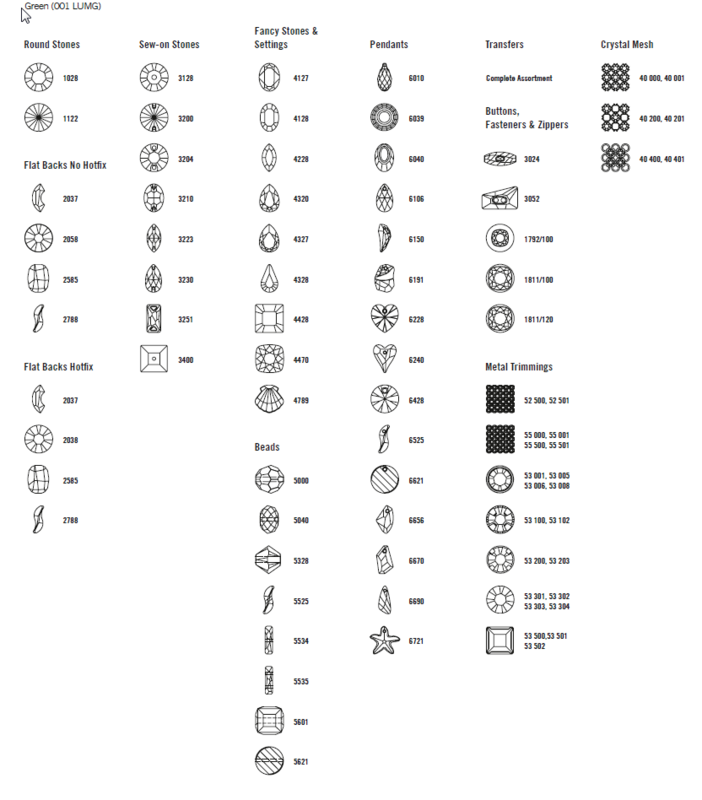 Yields easily to clean geometric and or repeating designs: floral, stars, flames, waves, mosaics, lacey, woven patterns. This is an upgrade from the 2028 XILION Rose Flat Back Hotfix. This new 2038 XILION Rose Flat Back Hotfix completely replaces the 2028 Hotfix. It will be offered at the same price as the old. It is easy to distinguish the retired 2028 vis-a-vis the new 2038. The proof of the advance silver mirror application is the rose color gold on the reverse side of the element. This new silver mirroring (A HF) is new and unique in the Hotfix market. 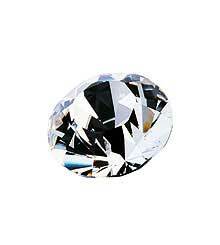 It creates a warmer, brighter look producing more intense, livelier colors (diamond like). It has an improved table size, making it even more brilliant than its predecessor 2028. The Rhombus was previously available in the Flat Back No Hotfix and is now introduced into the Hotfix category as well. Both are offered in the same range of colors and effects. A cooling shape - ideal for summer. It is ideal for the delicate, feminine look. Swarovski particularly recommends this for eyewear and watches. This comes out only in a tiny shape for those magical discreet touches of brilliant sparkles. Note: Metal Setting (4747/S) is also available for this shape. Let your creativity take flight with this uplifting shape. A romantic and playful shape, delicate & feminine. Ideal for combining with figurative shapes like flowers, hearts, and the existing Butterfly product range. Note: Metal Setting (4748/S) is also available for this shape. Ideal for oceanic, maritime, aquatic, tropical looks - especially with combined with other maritime symbols. A perfect addition to the summer trend of holidays, ocean views, and drinks by the pool. Invert it and combine with other geometric shapes for a distinctive Art Deco look. Lots of colors and effects for a true color play! Note: Metal Setting (4789/S) is also available for this shape. Mythical, hypnotic, with Art Deco tendencies - it turns easily to nostalgic, vintage, ethnic, and organic themes. A highly adaptable shape combining well with a myriad of shapes. Part of the new Wave Family - a sure and confident merger of graphic & multi-faceted with 3-dimensional appeal. Perfect for marine times and for strong athletic appeal. The hole is specially positioned, making it ideal to combine with pearls and other beads. This special wave shape accommodates individual use or aesthetic linking. Uncomplicated, minimalist - it is an ideal combination to other shapes and beads. Unpretentious and versatile. As with the 5534, this Column bead is unpretentious and minimalist, lending itself into an endless arrangement, by itself, and in combination with other shapes. With 2 holes, it has more stability and is ideal for bracelets, colliers, and structural arrangements. This comes in many different colours. 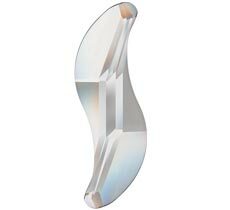 This is one of the most exciting, interesting items I have seen from Swarovski - I think mainly because of its unexpectedness. These little Crystal Mesh Balls are highly versatile. It is opulent and ideal for top-end looks. 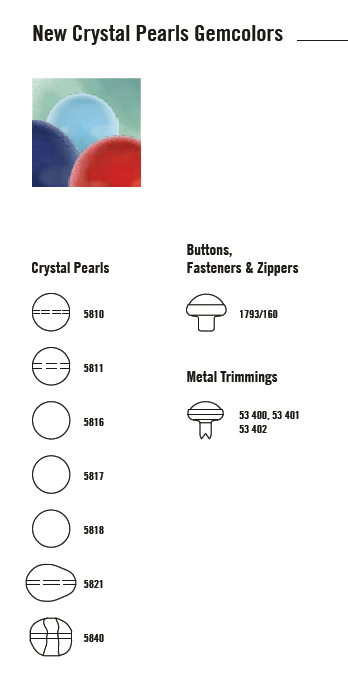 These products are a combination of Crystal Pearl covered with sparking Crystal Mesh - most ingenious. They are offered in 3 different sizes, with increasingly more sparkles to each. The trio of sizes make them ideal for creating matching sets (earrings, bracelets, necklaces, accessories). This pendant with its amazing patented XILION cut will completely replace the 6301 Bi-cone Pendant. The new 6328 is at the same price level as 6301. 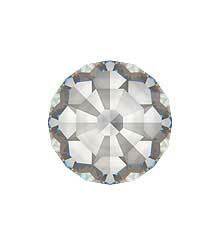 Swarovski has chosen to upgrade to the revolutionary XILION cut for this article. The XILION cut with its alternating larger/smaller facets results in superior brilliance and more intense light reflection. The XILION cut cannot be imitated: it is copyright protected. Modern minimalist with a sophisticated, futurist elongated look. Easy to use - only requires a jump ring/pinch, bail, chain, or cord. Also a perfect combination with other geometric shapes and Crystal Pearls. Appeals to both men and women. Part of the new Wave Family, the Wave Pendant is a confident merger of 3D with multifaceted graphics. Playful, sparkly, and utilitarian combined - launches in 3 colors and 8 effects. It has large holes: can be threaded with thicker yarns, leather, cord, or other unconventional materials. Excellently modern and stylish. Use also on armbands, wristbands, apparel, bags, and accessories. Part of the new Chessboard Family. Sophisticated with matching cuts for a unified look. Unisex - goes well for denim or sporty looks; classical or architectural styles. And for adding that extra touch of class.